With the football season underway, now is the opportunity for fans everywhere to catch the action in person. However, you may want to double check your bank account before painting your team's colors on your face. 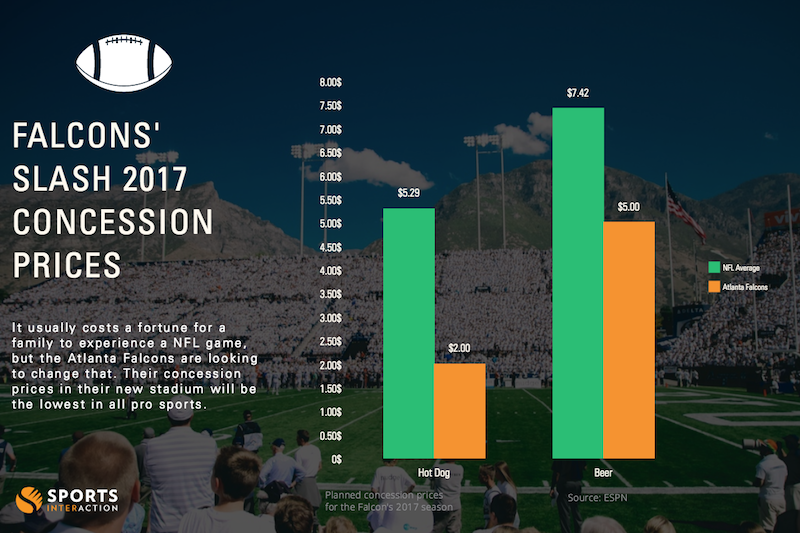 Each year, like clockwork, prices for NFL game tickets, along with the cost for beer and hot dogs at the concession stands, continues to rise. The average price of a regular season NFL game ticket during the 2016 season is about $86. The average price for a beer is about $7.40, and a hot dog is more than $5.00. Just to sit in the nosebleed seats, drink an overpriced 12 oz. beer, and eat a soggy hot dog will cost the average person about $98.00 this season. Oh, and we left out parking. If you're planning on watching the Oakland Raiders at the Oakland Alameda Coliseum, bring a few extra bucks for beer. One regular-sized beer at a Raider's home game will cost you an NFL-leading $10.75. The Raiders should also be penalized for selling the NFL's most expensive hot dog for $6.75. 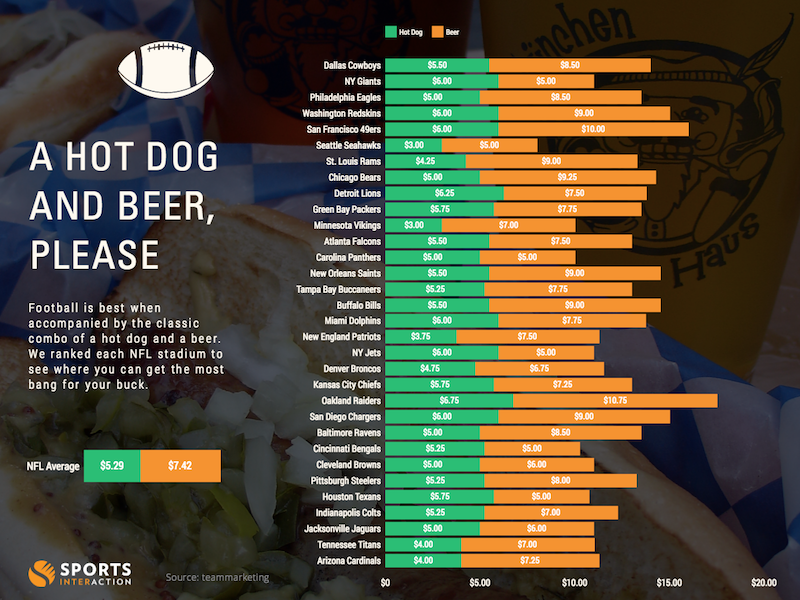 Thanks to some insightful infographics from our friends at Sports Interaction, you can see where your favorite team's beer and hot dog prices stack up against the NFL average. With NFL concession stand prices continuing to break records, it's nice to see one team fighting to make a difference. Currently, the Atlanta Falcons are in the process of drastically reducing prices at concession stands inside Mercedes-Benz Stadium, according to ESPN. Set to begin in 2017, the Falcons are prepared to offer unheard of perks to visitors. Steve Cannon, CEO of the AMB Group told ESPN, "We'll be able to feed a family of four at our games for $27." 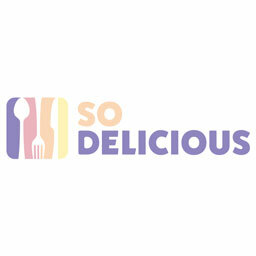 The Falcons will be offering guests a $2 soda with unlimited refills, along with $3 slices of pizza, among other reasonably priced items, beginning in 2017. With ticket and concession stand prices already on the rise, the Atlanta Falcons already have a reason to look forward to next season. However, this trend in price gouging raises concerns about the aspect of affordability for fans attending major sporting events. Is there an incentive for fans to continue spending absurd amounts for food and beverage alone, or are people just better off watching at home?